Creek 'n Woods III is a Smoky Mountain vacation rental cabin in Maggie Valley,NC. This 3 bedroom, 2 bath cabin sleeps 6-9 people, and is fully furnished-all you need to bring are your clothes and food. The cabin is located in the woods, feels like you're in a tree house, and the sounds of the waterfall off the back deck can be heard wherever you're sitting. The L-shaped covered porch has rocking chairs waiting for you, and outside dining tables and chairs. The hot tub is on the back deck, and at the end of a full day of exploring all that there is to do in Haywood County and the surrounding areas, it's a great place to soak away your cares (or the sore muscles and possible bruises from skiing or snowboarding). A gas grill with an extra tank is provided for your use. This cabin is on a paved road, and accessible year round. There are movies, games, puzzles, and books for your enjoyment, and WiFi and expanded cable are provided. This cabin is just minutes from golf at the Maggie Valley Club, and also nearby are The Wheels Through Time Museum, Blue Ridge Parkway, Great Smoky Mountains National Park, Harrah's Cherokee Casino, Cherokee Museum, Cataloochee Ski Resort, Biltmore Estate, whitewater rafting, horseback riding, fishing, gem mining, shopping, music, and more. Nothing is too far from Maggie Valley! We take great care of our guests from the moment you call to make your reservation to meeting you upon your arrival no matter what time of day or night that might be. After driving 4-13 hours the last thing visitors to our area need to face is the 'hunt for the cabin' in the dark. When we meet you, we take you to the cabin so that we can explain how everything works, provide directions to the grocery store, suggestions on where to eat, and what to do. For our motorcycle guests, we will even do your grocery shopping if you email us your list in advance thus eliminating multiple trips to the store for 'provisions'. If someone in your group is celebrating a special occasion (birthday, anniversary, graduation, etc) we will do whatever we can to make the occasion special by providing a cake, decorations or the names of local businesses who can meet your needs. We got married in Maggie Valley in 1996, fell in love with the area, felt we needed to live here, and moved from Ft. Myers, Fl. We love what we do and the people we have met doing vacation rentals since 2001. Maggie Valley is an ideal vacation destination. Located in the Great Smoky Mountains, we're close to everything. It 's a great place to vacation and that's why we have these 4 vacation rental cabins here in Maggie Valley. Our Creek 'n Woods cabins are completely furnished with everything you would need. All the linens, paper products, detergents, trash bags, basic spices and condiments. We even have starbucks coffee and biscotti. Creek and Woods III was a fantastic experience! The owner met us in town and escorted us to the cabin, then went over where everything was located inside as well as how to operate the hot tub and fireplace. No guesswork needed! We had 3 adults and 3 kids staying there and had more than enough room. The wraparound porch outside was really nice and the swing will be a favorite for anyone who stays here. A jar of fresh homemade cookies awaited us when we got there and the personal touches from the owners continued throughout our stay. 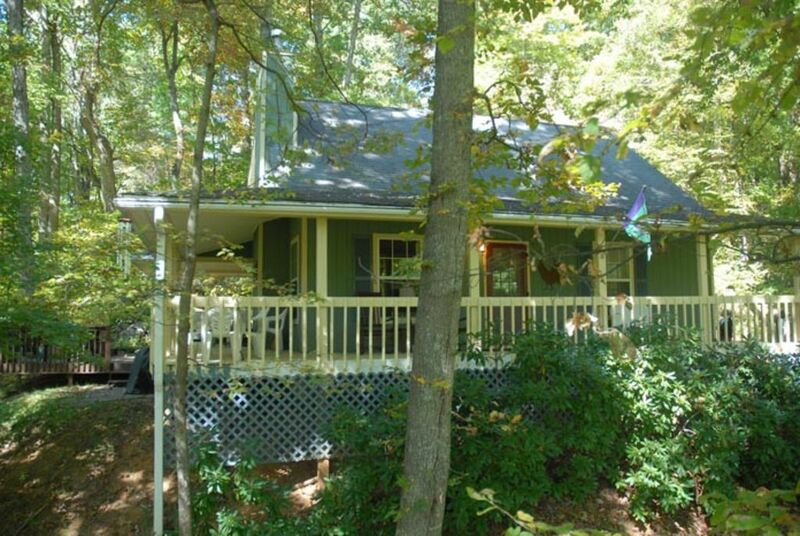 This property is EXTREMELY convenient to Maggie Valley being right in the edge of town but still felt secluded. It is a quick ride to Cherokee and all that it has to offer. We fished in Cherokee (NC waters were closed but Jonathan creek- a hatchery supported stream runs along the base of the mountain the house is on. It is literally a 3 minute drive). Anyone with kids may want to check out the family center Harrah’s has in Cherokee or the Factory over in Franklin. Slingshot rentals at The Cabbage Rose (recommended by the owner) was FANTASTIC! and we would recommend them HIGHLY as well. It’s a quick hop onto the Blue ridge Parkway and a fun ride in the slingshot. We will definitely be looking to stay with creek and Woods again in the future! We are so glad that you enjoyed our Creek 'n Woods III and the time and adventures you experienced in Maggie Valley. Thank you for choosing to stay with us. We appreciate your business and look forward to your return visits. It felt like a vacation in the mountains for sure. It was a true getaway from home. I appreciate the hospitality and everything within the cabin to give you that comfortable feeling. What a beautiful home with an amazing view! We are so glad you enjoyed your "MOUNTAIN TIME." We look forward to your next visit. We're are so glad that you enjoyed your stay at our Creek 'n Woods III. We look forward to your return visits. We are so glad that you enjoyed our cabin. We look forward to your next visit to the Smoky Mountains. Thanks for staying with us. We appreciate your business.